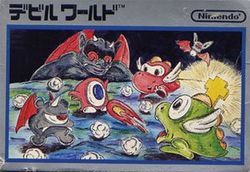 Devil World is an obscure title for the Famicom that was released in Japan and Europe, but was passed over for release in the United States. The obvious reason for this passing was because of the heavy use of religious iconography, and Nintendo's concern for religious sensitivity in America. Though the character in the game can clearly be viewed as a good guy, if only for the fact that the person he is battling is the devil, the mere use of the symbolic cross was thought to be potentially insulting to anyone observant of the Christian faith. You are Tamagon, an egg hatched fire breathing dragon. You are trapped in the Devil's mazes, along with his minions who try to put a stop to you. Your mission is to imprison the Devil by completing the goals of three stages. There is no end sequence to this game, it continues indefinitely. You control Tamagon through the maze with the control pad. You must eat every Boa-Boa dot by holding a cross in the first stage. You must gather every bible (book with cross) back to the center square in the second stage. The third stage is a bonus stage where you attempt to collect six boxes before time runs out. You must avoid contact with the devil's one eyed minions, and getting crushed by the scrolling edge of the maze. Tamagon can spit a fireball if he is holding a cross or a book. This page was last edited on 10 February 2016, at 21:43.